Your personal library contains images that only you can manage and reuse. 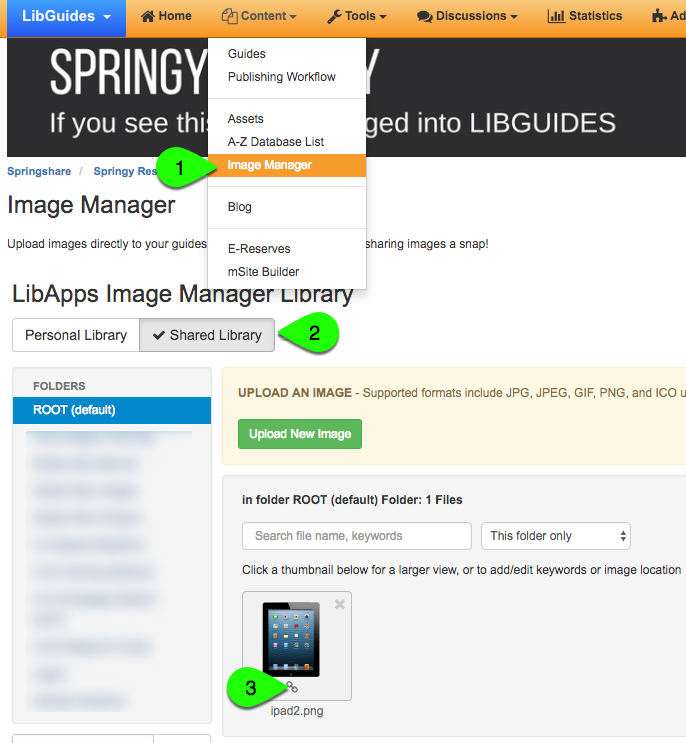 The shared library allows admin users to upload images that all users in your LibApps system can reuse. Each library can be further organized by folders and keywords, with the ability to both browse and search for images. 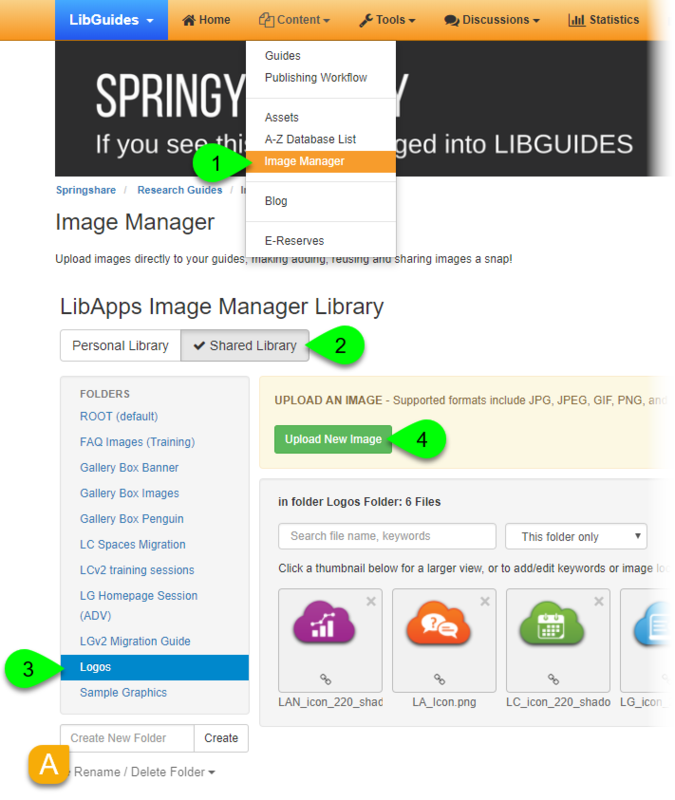 The shared Image Manager library allows admin users to upload images that you can all users can reuse throughout LibApps. Although all users can browse, search, and reuse images in the shared library, only admins have the ability to add and delete images and folders. Make sure the Shared Library button is selected. Navigate to the folder where you want the image to be stored. Or, use the Create New Folder field to add a new folder for your image. Click on the Upload New Image button. Select the image from your computer to upload it. Supported formats include JPG, JPEG, GIF, PNG, and ICO up to 5MB in size. No, you can only upload images one at a time. Select the library that contains the image. Click on the View/copy image URL () icon. Adding alternate text to your images is an accessibility best practice. By adding descriptive alternate text to each image, you are providing users of assistive technologies (such as screen readers) a description of the content of the image. With the Image Manager, you can actually add default alternate text to your images. To help in locating images that have been added to the Image Manager, you can search by the file names and keywords that have been added to an image -- and you can search within a single folder or across all folders in a library. Note: it is not possible to move images between the Shared Library and a personal library. Creating folders within the Shared library allows you to better and organize and manage your shared images. Caution: Deleting a folder from the Image Manager will delete the folder and all of the images in the folder.